For example, protein found in fish, chicken and beans builds muscle for physical strength. When patients lack healthy protein sources, signs of malnutrition appear. Without Jesus, the living Messiah, we can lack basic nutrients of life. In 2 Timothy 2:1, Paul writes that “the promise of life” is in Christ Jesus. Starches found in bread and rice give us daily energy, whereas Scripture is our spiritual bread. We need to nourish our faith daily through reading and studying God’s Word. Jesus responded to Satan by quoting from Scripture, “Man shall not live on bread alone, but on every word that comes from the mouth of God” (Matthew 4:4). Vegetables supply the nutrients for each cell in our body, yet many of our diets lack an adequate intake. Thus, I couldn’t help but think of prayer in comparison to vegetables. Although prayer is vital for our faith, we often fall short on the amount of time we spend in prayer. Being busy isn’t an excuse. “But Jesus often withdrew to lonely places and prayed” (Luke 5:16). 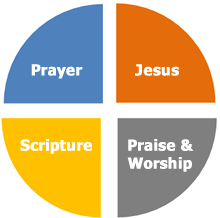 The building block of our faith is also found in praise and worship. I think of this as fruit. When we lift our voices in song exalting the goodness and excellence of our gracious Heavenly Father, we experience the sweetness of his presence. It is rich in nutrients, yet leaves us hungry for more and more! “Through Jesus, therefore, let us continually offer to God a sacrifice of praise—the fruit of lips that openly profess his name” (Hebrews 13:15).